Less frustration for motorists. Less pollution in our neighbourhoods. Still safe for pedestrians. Good idea or madness? 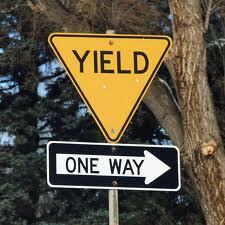 Beaconsfield will soon be replacing stop signs with yield signs, improving the flow of traffic on their side streets. This somewhat off-beat sounding method is the norm in many jurisdictions outside of Quebec. When I first saw this kind of setup 25 years ago in Winnipeg I thought it was kukoo. But lately we’re seeing roundabouts make an appearance in Quebec and so this yield sign craze might just take off too. Can it work in Cote Saint-Luc? It’s worth watching Beaconsfield and studying the situation here at home. I’ll be bringing this idea to our Transportation committee to ask our experts what they think. Meanwhile, what do you think? Please offer your input by clicking comment. Read the Gazette article here: Yield signs will replace stop signs in Beaconsfield | West Island Gazette.